How work the Paste HTML command in QuickTextPaste? You can also paste the html formatted text styles and send is to other Programs via Windows Clipboard and Keyboard-Shortcuts! Caveat! Each program interprets HTML differently so it is not always 100%, the desired result. 1.) ... Working with paste Html! 2.) ... More possibilities for paste HTML! 1.) Working with paste Html! Now to explain, pastehtml: causes QuickTextPaste to insert the text as HTML to the clipboard and send it to the active eg. foreground program. And so, the selected text is placed in the clipboard and is inserted through QuickTextPaste at the place from the placeholder %copy_text%. Here the imagination has no limits if you want to use this useful function. Tip: At the point of %copy_text% you can also use %copy_html% to copy the formatted HTML text at the placeholder %copy_html%. Well suited for MS Office or Open Office to don't change the current text format. (Image-1) work with Paste HTML command! (Image-2) HIGHLIGHT HTML command in QuickTextPaste? (Image-3) Paste HTML via ALT Gr+N! See this: ... working with date, time and calendar week in QuickTextPaste! 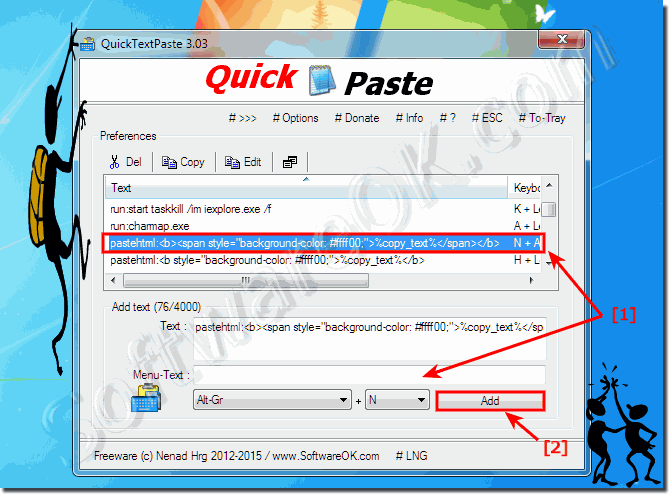 QuickTextPaste - FAQ-15: How work the Paste HTML command in QuickTextPaste? When creating a paste, there can be hyperlinks which are pasted as the plain text, how to make them paste as hyperlinks at once? Formatting like BOLD, ITALIC, UNDERLINE, STRIKETHROU etc... through quicktextpaste? I downloaded QuickTastePaste as its exactly what I need for work when sending lots of similar emails.I have a question though. When I send these emails I copy and paste an image from a template I have. I then use your software to quickly input the subject into the email. But when I go to paste the template with the image into the next email it inputs what I have set on your software. This probably doesn't make sense sorry! I highlight my own template which includes an image so I cant use QTP. Then press ctrl c then open and an email and in the body press ctrl v. I then go the subject and use ctrl 1 which I set using QTP to 'looking for work?' which works fine. I then open a new email and go to do crtl v but it comes up with 'looking for work'. ?